Wheelersburg head coach Derek Moore visits the mound to discuss the Pirates strategy with his pitcher, Cole Ratcliff. Portsmouth West senior pitcher Dylan Bradford started for the Senators Wednesday against SOC II rival Wheelersburg. Wheelersburg senior Trey Carter scored the Pirates first run Wednesday night in their win over West. 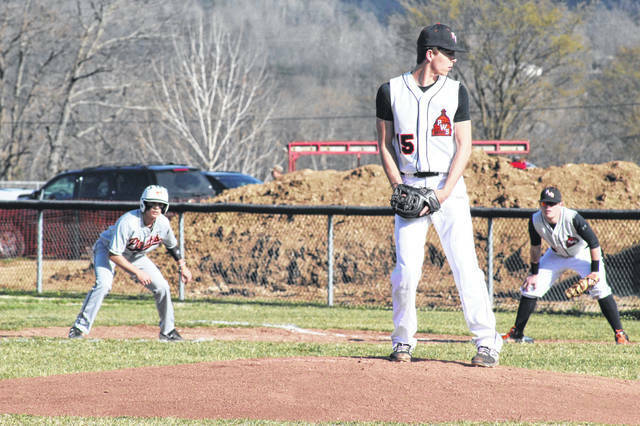 WEST PORTSMOUTH – It may have just been barely enough to do so, but the Wheelersburg Pirates (5-2, 4-0 SOC II) did just enough to escape the West side of Scioto County in Senator country with a road win over Portsmouth West (3-2 2-2 SOC II), 5-4 Wednesday night. Give them their best shot is something West certainly did. 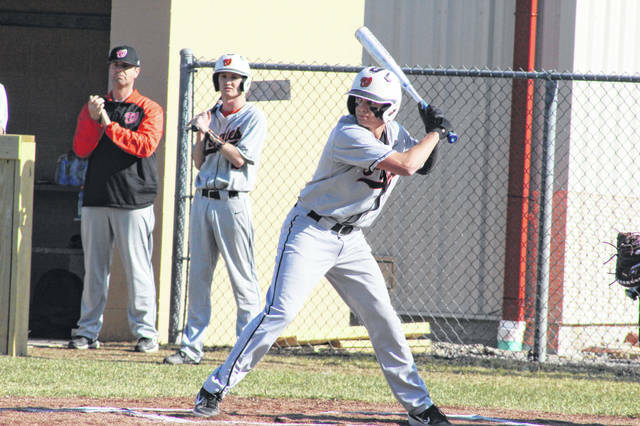 Wheelersburg began Wednesday’s game by scoring two runs as seniors Trey Carter and Connor Mullins touched home plate in the top of the first inning off excellent base running and timely hitting from the Pirates hitters. But if Wheelersburg believed their early lead would extend to a large deficit as did their lead in Monday’s 8-0 win over the Senators, they would soon find out that wouldn’t be the case. West quickly answered with a two run first inning of their own thanks to a Garrett Hurd single and a Dylan Bradford double, as well as more solid baserunning, allowing both seniors to cross home and tie things up at two. To their credit, Wheelersburg was determined to retain their lead. Connor Mullins stole home after reaching on a single in the top of the second to give the Pirates a one run advantage before Cooper McKenzie drove in Jalen Miller to put Wheelersburg ahead 4-2. From innings two through five, Wheelersburg’s Cole Ratcliff allowed just one Senators hit, a double to left field in the bottom of the fifth inning from Garrett Hurd. Ratcliff was lights out, and so was his defense to back him up. Wheelersburg added another run in the top of the fifth on a Trent Salyers RBI infield single. From there, the Pirates would take their lead into the bottom of the sixth where Jalen Miller would take over for Ratcliff after a limitingn West to just two runs. After giving up two runs in the bottom of the sixth, the Pirates would take a one run lead at 5-4 heading into the seventh and final inning. Despite having runners on first and second with just one out in the bottom of the seventh, West would be unable to advance the tying run across home plate, falling short to their SOC II rival, 5-4. For Moore, with the way his pitching and defense have been playing, when his bats come around, he knows his guys will be a team no one wants to face by season’s end. Wheelersburg will prepare to face South Webster Thursday to try and improve to 5-0 in SOC II play. For West, they’ll get ready for their two game series with the Waverly Tigers this Friday and Monday. 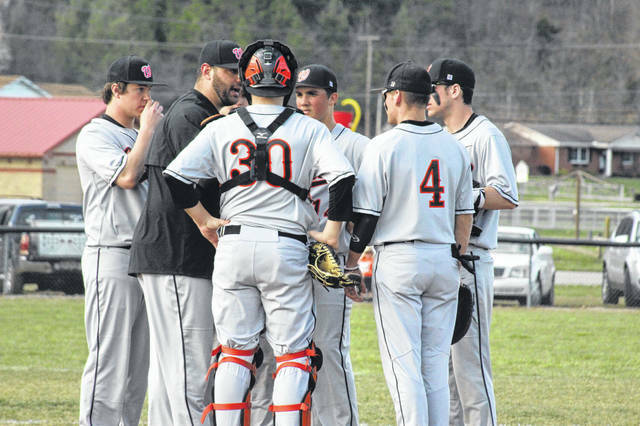 https://www.portsmouth-dailytimes.com/wp-content/uploads/sites/28/2019/04/web1_IMG_4716.jpgWheelersburg head coach Derek Moore visits the mound to discuss the Pirates strategy with his pitcher, Cole Ratcliff. https://www.portsmouth-dailytimes.com/wp-content/uploads/sites/28/2019/04/web1_IMG_4613.jpgPortsmouth West senior pitcher Dylan Bradford started for the Senators Wednesday against SOC II rival Wheelersburg. https://www.portsmouth-dailytimes.com/wp-content/uploads/sites/28/2019/04/web1_IMG_4610.jpgWheelersburg senior Trey Carter scored the Pirates first run Wednesday night in their win over West.